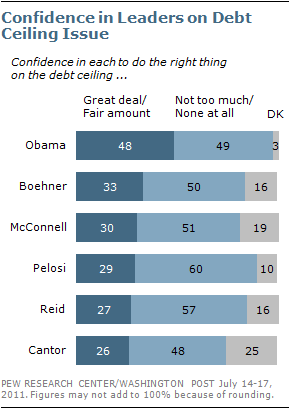 The public expresses far more confidence in President Obama than it does in congressional leaders of both parties when it comes to the debate over the debt ceiling. Nonetheless, only about half of Americans (48%) have even a fair amount of confidence in Obama to do the right thing when it comes to dealing with the debt ceiling, while nearly as many (49%) say they have not too much confidence or no confidence at all in the president on this issue. Most independents are skeptical of Obama: 42% express at least some confidence in him on the debt ceiling while 56% say they have little or no confidence in him. Nonetheless, this is more confidence than independents have in any congressional leader. 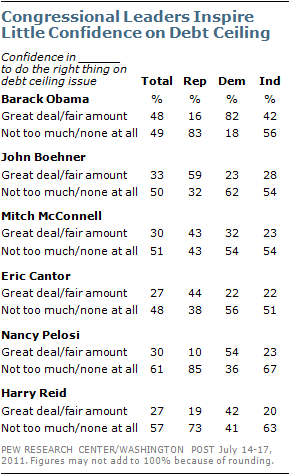 Just 28% of independents say they have a great deal or fair amount of confidence in Boehner to handle the debt ceiling issue, and the proportion is even lower for the other congressional leaders tested. 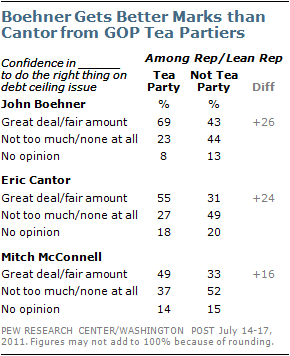 Republicans and GOP leaners who do not agree with the Tea Party have less confidence in Republican leaders – 43% express at least a fair amount of confidence in Boehner, 33% in McConnell and 31% in Cantor.